Serve the tortilla soup in a beautiful talavera plate. If you need corn tortillas to prepare the soup, these have a very good flavor and excellent consistency. 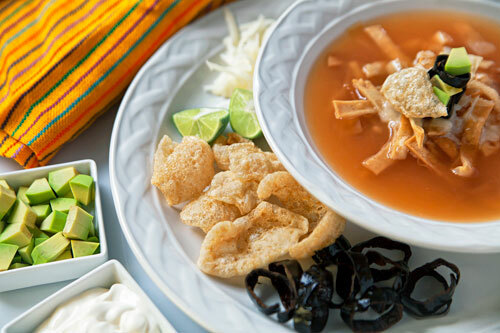 Without a doubt the tortilla soup is one of the most representative dishes of the Mexican gastronomy. Its origin is attributed to the state of Tlaxcala (soil of maize) and the dish represents the fusion between the Prehispanic cultures with the Spanish. The most interesting thing about the tortilla soup is that not only the chef or the cook prepare it, no. They also give the opportunity to the diner of customizing the dish to their liking , with a large amount of optional and complementary ingredients that are put on the table like: cream, chili, avocado, pork rind, etc. In this way each diner puts to this entree plate their own special touch. Making the tortilla soup is laborious because it consists of many steps and stages. Follow the directions carefully so your soup will be a success. We recommend to leave outside, all night long, the tortillas that are going to be used in this soup so they lose moisture and in this way they end up crispier. Such a Mexican recipe like this one has to be prepared with a Mexican broth. Grated cotija cheese is put to the soup but diced panela cheese could also be used. Preparation time 30 minutes . Strain over the saucepan the salsa that was blended and fry it for about 3 minutes, until it thickens a little and acquires a more intense color; stir occasionally. 1½ qts of Chicken Stock. When the broth boils reduce to low heat, cover the saucepan and leave it cooking for 15 minutes, so the flavors mix. This cooking is done to obtain all the seasoning and aroma of the different ingredients. Cut 9 corn tortillas into small strips, then reserve. Introduce in the frying pan the tortilla strips that were cut and fry them for approximately 1 minute, until they are moderately fried; stir occasionally with some tongs. Transfer from the frying pan to some paper towels, with the tongs, the tortilla strips that were fried so they dry and the fat excess is absorbed. Then set aside. Discard the veins and the seeds of 2 pasilla peppers. Slice the 2 pasilla peppers with the ones you worked, then reserve. Heat in another frying pan over medium heat 2 tablespoons of olive oil. Incorporate in the frying pan the pasilla pepper slices that were cut and fry them for approximately 1 minute, until they are lightly fried; stir regularly. Don’t fry the pasilla peppers for a long time because its flavor becomes bitter. Transfer from the frying pan to some paper towels the pasilla peppers that were fried, so they dry and the fat excess is absorbed. Put in a ramekin the pasilla pepper slices that were dried and reserve. Put in independent ramekins 1/2 cup of Mexican cream and 1/2 cup of grated cotija cheese; then set aside. Put in another ramekin 2.6 oz of pork rind into small chunks and then reserve. Cut 2 limes into wedges, put them in another ramekin and reserve. Dice 1 avocado and put it in another ramekin. Discard from the saucepan, where the broth was cooked, the epazote sprig. Put in each plate, where the soup is going to be served. Some of the Tortillas Strips that were fried. Some of the Broth that was cooked. The tortilla soup has to be served immediately otherwise the tortilla strips are going to soften. * The tortilla soup is also known as Aztec soup . Variation: If you liked the concept of having many ingredients on the table to keep on preparing the dish – you will love the Tlalpeno soup. Did you like the Tortilla Soup?